Student life is socially-validated slumming – be sure to abuse this. It’s orientation week around the country. 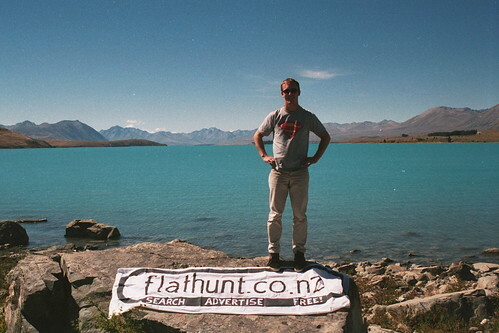 This time seven years ago Dave (pictured) and I were tripping around the South Island spreading the word about flathunt.co.nz. Later the site was acquired by Trade Me and over a number of years morphed into Trade Me Property, but at that stage it had just launched and was desperately in need of some customers. We stopped at pretty much real estate agency and property manager we could find, and tried to convince them to use the service, but I doubt we got a single listing. It was a much better reception at the universities where there were lots more internet-literate people in need of a room or a flatmate who were also poor enough to be reluctant to shell out $30 for a newspaper ad and willing to give something new a go. In case you’re wondering, Lake Tekapo had no role in the marketing strategy – it was just a beautiful place to visit en route. And the sign is looking a little beaten up after an outing the previous night at Carisbrook for the one-day match between NZ and Australia. At the time having the freedom to do things like that was half the attraction. Can’t believe that was already seven years ago! Judging by the “fashion” on show it could be 17 years ago – tan trou? Grey marl T-shirt, anyone? Superman? If I recall the one-dayer at the ‘Brook was a cracker too – a highlight was Brett Lee sconing Adam Parore with one he didn’t even see. I bet Stephen Fleming replays the tape of that one over and over on his flat-screen.